We’ve seen them at zoos and maybe even Sea World, but do you have a friend who is overly passionate about seals? If so, there are so many gifts to choose from for your friend’s birthday, holiday, or special occasion. Many of them are absolutely adorable and would be amazingly thoughtful. Do you love more than seals? Here is our complete guide to animal lover gift ideas – for every animal out there! Young or old, everyone loves stuffed animals, especially one that comes in the form of their favorite animal. A twist on the phrase, “deal with it,” your seal loving friend will truly enjoy the snarkiness of this shirt. An adorable sign to hang in the yard, or put up in the window of your favorite seal lover’s house, announcing their love for the animal. 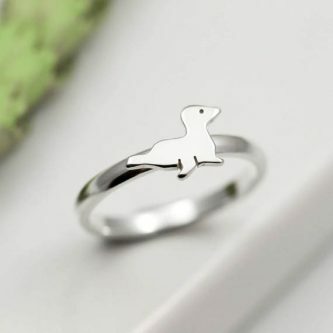 A cute seal on a ring to adorn your seal loving friend’s finger and show off to others. 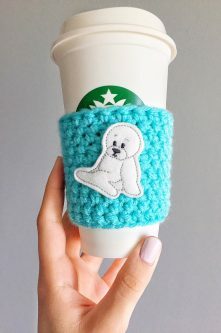 Help keep their coffee warm with this knit seal coffee cozy. It’s cute and actually feels cozy! Fun and whimsical seal pup shower curtain with both regular seals and unicorn seals. Perfect for the seal lover who also loves unicorns. Before their coffee, they only speak seal. Give everyone else fair warning to leave them alone until they finished their first cup. 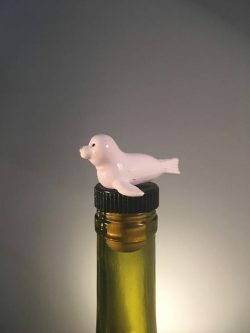 This seal wine stopper will help keep their wine fresh, while also being nice to look at. Your seal loving friend will enjoy using it and smile each time they go to refill their wine glass. Give your friend the gift of adorable decoration to put up on their wall. They will enjoy looking at it and so will their guests. Help your seal loving friend a lovable place to lie their head at night, so that they can get a good night’s rest. Artwork and a mug to drink coffee from, all in one. The colors used in the watercolor image of the seal make it much brighter and inspirational. If that special seal lover in your life is a kid, they will love and enjoy wearing this plush seal hat that has fun ear flaps to go along with it. 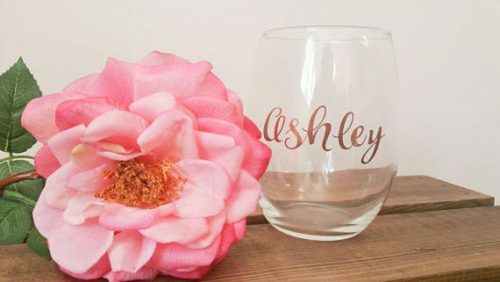 Make their experience of drinking wine even more special and enjoyable with this seal etched wine glass. Basic, but nonetheless adorable, your seal loving friend can put this decal on their car or a laptop, or anywhere else it can stick. The squishy seal on the back of the iPhone case can be relaxing and help them hold their phone without letting it slip, not to mention that it’s also super adorable and colorful. 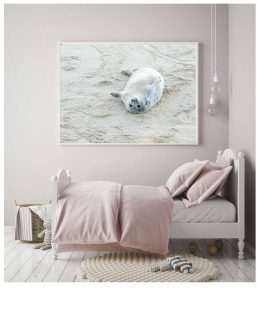 If they are a fan of posters or wall art, then they will certainly enjoy this poster with a seal near the ocean. 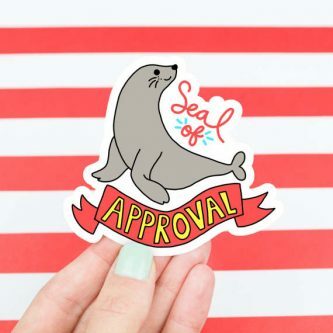 Give them a seal of approval with this large seal animal sticker for their planner or other needs. For the special kid in your life who loves seals, they will find this book funny and entertaining to read, before bed or just for fun! 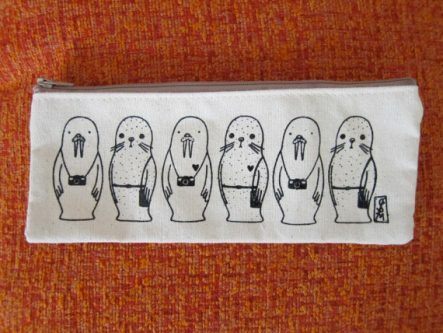 A unique walrus seal pencil case for their school, art, or writing supplies will make it easier to carry it around and get what they need. 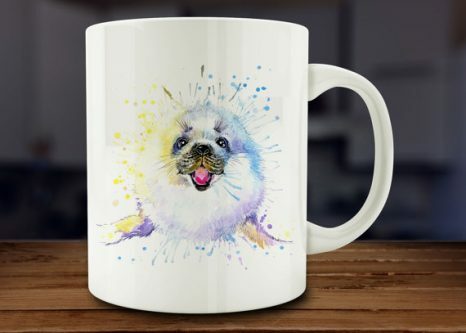 Seals are adorable on their own, whether they can do tricks or not, and your seal loving friend will appreciate a thoughtful gift that they can cherish for a long time.